I've not been doing very much with a camera in the last week or two so I thought I'd "regale" you with something completely different, as a bunch of Oxbridge graduates and an irreverent American used to say. 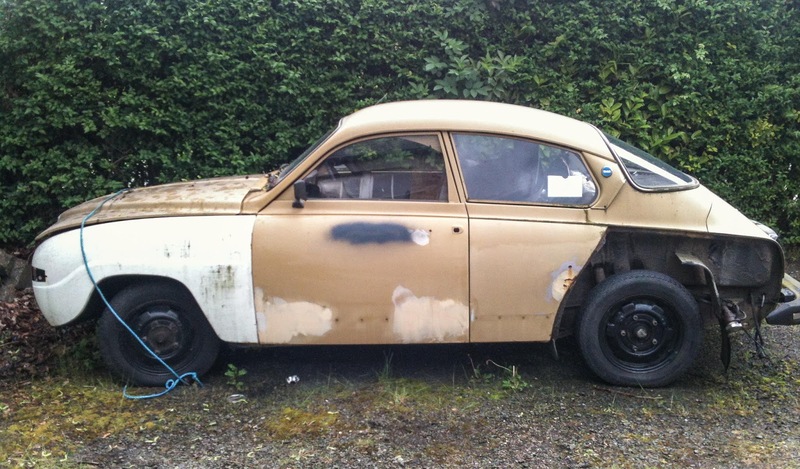 This tale involves my efforts on a subject I think of as Project Saab - my hunt to find a Swedish chariot that needs a bit of work - but not too much. I've been searching for most of the year but still haven't found something suitable. Although I live in a part of Scotland that used to have three Saab franchises within an area about 40 miles in diameter it's proved a real struggle to locate the right kind of car. Mind you, we are talking about a model last made in 1993/94 - at the latest. If I lived in the centre of England, it wouldn't have been a problem as cars come up for sale there quite regularly but I'm afraid I'm not so enthusiastic that I'd want to make an 800 mile round trip to view and buy - or possibly not buy - a Saab. This whole Project Saab thing might appear to be somewhat out of left field so a brief bit of history would be a good idea at this point. First of all, I've been a bit of a car nut all my life. I wrote a weekly motoring column for one of the newspapers I worked for getting on for about 15 years, test driving hundreds of cars during that period. And all of it was done in my own time. Despite them all, however, it was always the pre-GM Saabs that I liked the most. There was just something about their quality build, fine engineering, quirkiness and, in the case of the 99 Turbo, the first production car to be fitted with a turbocharger (The BMW 2002 range had one earlier but they weren't really production models), their performance. 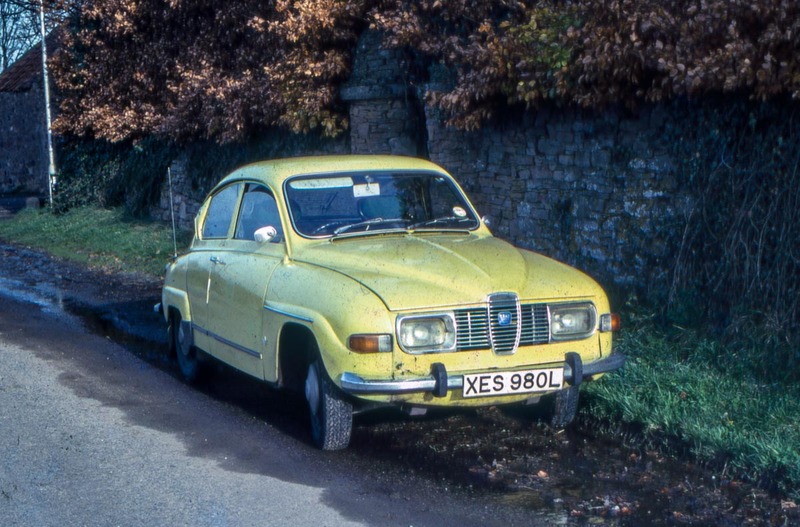 The very first car I bought was the 1973 Saab 96 below. It's a scan of a slide that I found covered in muck at the back of a drawer so it doesn't look too great. It cost me £400 and was in truly beautiful condition. I drove it for a year or two and then passed it on to my brother who used it for a while and then, unbelievably it seems now but didn't at the time, scrapped it when the repair needed to the gearbox was going to cost more than the car was worth. That was a huge mistake and I wish we'd held onto it because they're becoming quite scarce. My first efforts on the Project Saab front were aimed at sourcing another 96, something which I eventually managed to do through a contact. The car, that's it at the top of this post, was in Edinburgh and although a poor sight was structurally sound. It needed the wings bolted back on, a bit of paintwork, a retrim of the seats and just a bit of engine fettling and it would have been ready to go. 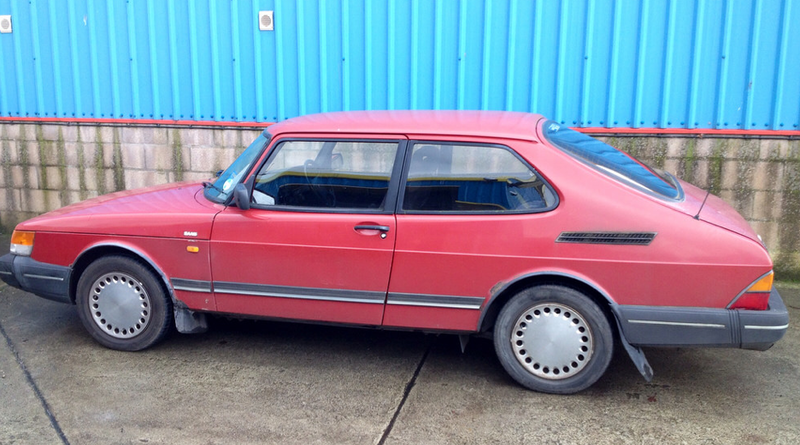 Realising that it would be difficult to find another 96 in my neck of the woods, I thought I'd cast the net a bit wider and include the original Saab 900 Classic amongst the possible project cars. After giving the 96 to my brother, I went through a few cars before buying a 1982 900 Turbo that was my favourite of all the cars I've had - and there have been a fair few. So I thought it would be fitting to get a 900 if I couldn't find a 96. Well, the availability of 900s is only marginally better than that of the 96, it would seem. Getting a bit desperate, I called a former Fife Saab franchise that is still operating as an independent garage and found that the owner's father had one which he used to get to and from work a few days a week. It belonged to an old woman who bought it new from the garage and had it serviced there every year until a year or two ago when she started hitting things on a regular basis and gave up driving, returning the car to the garage. It might be for sale if I made the right offer, the owner said, so I had a good look and a test drive, took a few pics and uploaded them to a Saab forum where the members there quickly told me it was worth about half what I had intended to offer and convinced me to wait for a better project car to turn up. That's the Fife vehicle below, a base model 900, with faded paintwork but MOT'd and running quite nicely. 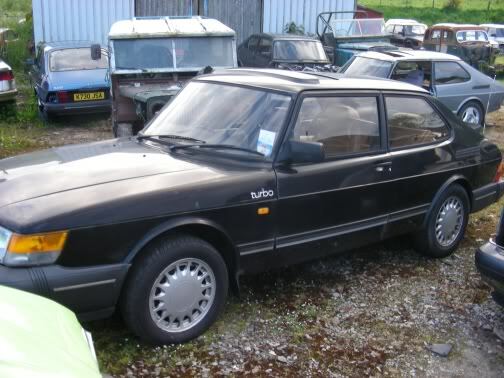 Then someone on the forum put me onto a guy about 50 miles away who is a bit of a Saab enthusiast, suggesting that he might have something suitable. I contacted him and found that amongst all the cars he keeps for spare parts and for restoring, he has a black 900 Turbo that needs an MOT and was going cheap. You can see from the pic below that the owner is a Saab nut - in fact, a car nut in general. He lives in the country and has an old workshop surrounded by cars in various states of repair. At the moment, he's restoring a 900 Carlsson, a high-performance 900 Turbo named after the legendary Swedish rally driver, Erik. I actually test drove a Carlsson way back in the early 1990s. It was very quick but the suspension was too hard for my taste and I preferred the "ordinary" Turbo - but I'll keep that to myself. So that's where I am now, planning a trip to check the car out and see if we can do a deal. The one thing putting me off is the fuel consumption. The black Turbo is an automatic and probably wouldn't do much more than about 25 mpg in everyday driving. Given the cost of fuel at £6 a gallon (or whatever - I've long since stopped trying to work it out now that petrol is sold in litres), going anywhere becomes an expensive proposition. Still, as a car to keep in the garage and take out on high days and holidays, it might be a bit of fun worth the price of admission. Good luck Bruce whichever path you choose. 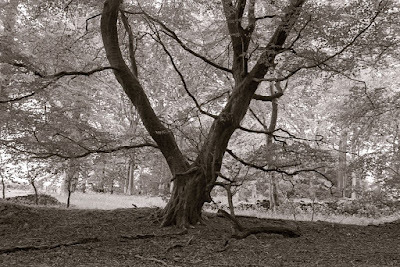 It also really interesting to see that people have lives outwith photography (when you read some blogs etc it's like they were born with 2 Summicrons for eyes and an Elmar for rear shots, but at the end of the day isn't photography all about recording that which you find interesting?) so I hope you get some more comments from people chivyying you up! And if nothing comes of this, well you've shown another side of you life to the world - that's a good thing. When I was driving around in my Cortina Mk1 mid 1970's lusted after a Saab 96 estate . Never owned one though. Didn't it have some kind of free wheel device/ mechanism for fuel economy? The Saab estate was known as a 95 - and I had one of those as well. All the V4 engined Saabs had the freewheel device which basically meant you were coasting as soon as you lifted off the gas. The 96/95 models make really practical classics with pretty good fuel consumption - if you can get your hands on one. I'm with Herman on this one. It's always great to see another side of your favourite bloggers world. Also being a bit of a petrol head my self I like hearing about classic car restorations. At least the price of classic cars in the UK is considerably cheaper than here in Australia. I did much prefer the 95/96 style SAAB.More sort of 1950's looking car than the later wedge shaped models. A work colleague had a 72/73 SAAB 96 and it was the only orange painted car in the car park! The Saab 96 was a pretty good rally car, especially on snow. The SAAB engines which were of the two-stoke design had a freewheel in the drivetrain not for fuel economy but to protect the engine from seizure. Unlike the much more common four-stroke engines, two-strokes do not usually have an oil reservoir from which lube is pumped through the engine, but instead are lubed with oil that is mixed in the tank with the gasoline. When the throttle is open, this works just fine but when you close the throttle to coast, the gas--and oil--do not get into the engine in sufficient quantity to lube the engine, which is still running fast since it is driven through the connected clutch. You could just push in the clutch pedal and not need the freewheel but no way was SAAB going to rely on drivers to remember to do that! I don't see how a freewheel could improve fuel economy, since the throttle is closed anyway when coasting. A significant downside, though, is that you do not have engine-braking capability, which most drivers are used to. For Gads sake, get a Reliant Robin, they are all over up there. And they don't rust. Michael, that's right about the early two-stroke Saabs and the freewheel. Saab fixed that when they later added oil injection. They kept the freewheel in the V4 cars and the early 99s partly because it did help fuel consumption, by around 10% or so. Without a freewheel and easing off the gas, your car would normally be revving higher than a car with a freewheel because its at idle. Some drivers, I'm one of them, prefer the smoothness you get when driving with a freewheel because there's no jerk from engine braking. Plus, after the freewheel cuts in you don't have to use the clutch for your next down shift.